This is a meal I made on Christmas eve! My parents were here for their annual holiday and we had a busy social time with them for a week. We went out to eat a LOT and on Christmas eve we had lunch at Mariana’s. We needed to eat supper, but of course we did not want anything too heavy and pasta seemed like the best option. My dad is on a gluten free diet, and so this meal was prepared for two different types of pasta’s. Thankfully, the wheat based pasta and the gluten free pasta cooks for the same amount of time – the only thing I needed was enough stove space for two large pots of boiling water. I am really lucky that I have gas burner as well as a four plate electric stove, so space is never a problem. As we had been out all day, I did not want to spend hours in front of the stove. This is when having a basic tomato pasta sauce in the freezer really helps – the long slow cooking needed for a rich tomato sauce had been dealt with before the day. I always make extra and freeze the left overs using 2 ladles as my measure. Yum! I think it’ll be delicious. I LOVE anchovies. Great pasta dish. 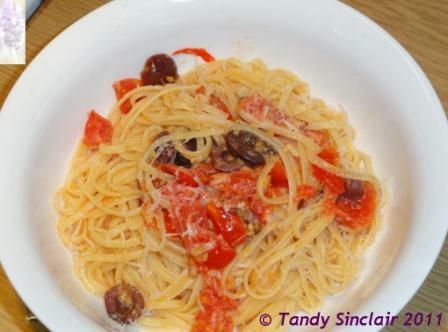 I think this ranks as one of my fave pasta dishes, the anchovies do it for me.